What do Martha Stewart and Yvonne Johnson have in common? They both spent time in prison. Stewart, wealthy and famous, served five months for manipulating stocks, while Johnson was charged with first degree murder and sentenced to life imprisonment. This is where the similarities end. Stewart recently spoke at Leadership Conference for Women in Calgary and, when asked about her prison experience, said very little rehabilitation happens and that many of the women should not be there, because of unfair trials. Johnson grew up marginalized from childhood onwards. After having gone from one prison to another for 19 years, she continues to live in poverty. However, she is trying to recreate a life for herself and her grandchildren by sharing her life experiences and helping others to benefit from the insights she gained. Johnson is supported in this by a group of friends, including Rudy and Tena Wiebe with whom she has a special relationship, given that Rudy co-authored Johnson’s autobiography, Stolen Life: The Journey of a Cree Woman, with her while she was in prison. The book builds a case that casts doubt on her trial and became a national bestseller. In 2008, Johnson received guardianship of her two grandchildren. She is very protective of them and tries to guide them to make good choices. She applied for an apartment for the three of them, while at a halfway house. Johnson also completed many courses offered in prison and is interested in creating a website to sell her native artwork. She has had a number of requests to speak to the law class at the University of Saskatchewan. While there, she has sold many of her books. 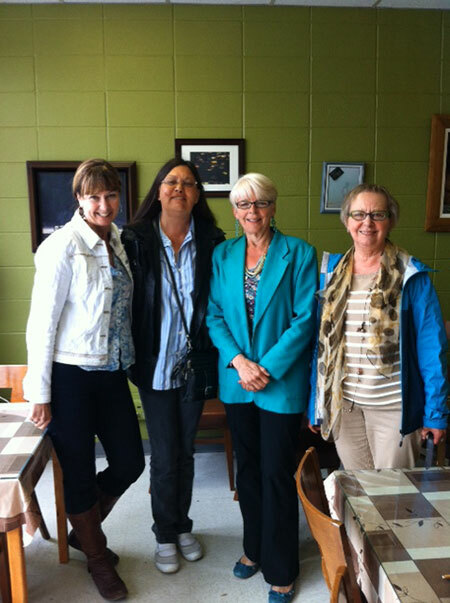 Another friend, Mary Stacey, who is deeply interested in native women, runs a counselling service for women like Johnson and recently met with her. That has given Johnson a new sense of excitement about sharing her experiences and becoming self-sufficient. Johnson’s physical and emotional health have been impacted by her experiences—inadequate housing and the demands of raising two grandchildren now entering their early teens. She is reviving A.I.S.H (Assured Income for the Severely Handicapped) and would like to find steady work. But she tires easily due to medical conditions. So a group of friends is assisting her with getting resources she needs for speaking engagements and other opportunities to sell books in order that she can have her own way of supporting herself and her grandchildren. Johnson dreams about her grandchildren being able to experience the love of the land that was so vital to her when she was a child. She talks about gardening and having a sweat lodge. Her eyes brighten when I tell her we have room on our property for her to do these things. This summer, her grandchildren are enrolled at Camp Valaqua, Mennonite Church Alberta’s year-round facility, and also at Ghost River Rediscovery Camp for indigenous children. It has been a delight to see Johnson smile and to see glimmers of hope in her eyes. Most of all, she has reminded me that hope is a gift friends can give each other, and that has more value than just writing a cheque. 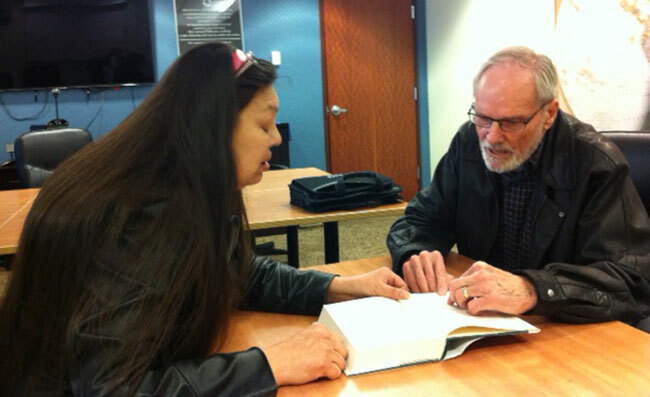 Yvonne Johnson and Rudy Wiebe together authored Johnson’s autobiography. Mary Stacey, Yvonne Johnson, Kate Janzen and Jeannette Thiessen are friends who support Johnson in working to become self-sufficient. I have just finished reading "Stolen Life," not having come across it before. It was a difficult read 'though nothing in my own life has approached the agony recounted in this autobiography. Nevertheless any reasonably sentient person would vibrate with the horror of Johnson's history - especially knowing how many other girls and women among the indigenous community have experienced similar lives. Yvonne is unusual in that, although a lifelong victim, in her psychic pain and confusion she struck back - not at those who directly abused her but at someone whom she thought was perpetuating the cycle of abuse. None of her subsequent trials and incarcerations should have been necessary, any more than her own action should have been almost inevitable. The tragedy is that Yvonne's story is NOT unique. Across this battered globe girls and women are chosen as scapegoats - in the most classical sense of living sacrifices - to the personal inadequacy of males driven by socialization that glorifies machismo, misogyny and violence. This is not limited to indigenous, oppressed or marginalized peoples, but it plays itself out most strongly among these groups who are also collectively chosen as socio-economic and religious pariahs or scapegoats. The litany of of the oppressed goes back as far as humans have history, and the thread of history has swept up numerous groups at various times, in various places. One could write an endless saga of the atrocities committed by the (perhaps temporarily) victorious against the losers, the weaker, the scapegoats, the enslaved. The real question is why humans have so universally degraded each other? Is this the original sin of which so much is made in so many religions? If so, then religion is fundamentally complicit in this inhumanity. It is a philosophy and doctrine that must be reformed, wherever it raises its ugly head. Truth and reconciliation programs may perhaps make a dent in the phenomenon but more fundamentally we must learn, and teach, that all humanity, indeed all life on earth is worthy of respect. It is a tall order when we seem to be genetically programmed to react with fear and violence to the "alien," to those who seem to obstruct our "selfish genes" and those whose imperfections engender fear and disgust. In my 75 plus years I have grown to despair of humanity's chances for survival. We seem always to have been on a path toward ultimate destruction. The only hope for survival - and it is an ambiguous one - is that scientists predict that males are genetically headed toward self-destruction at a cellular level. It will take a few million years, but it seems inevitable and the unanswered questions are: will we survive long enough to actually emasculate humanity, and if/when we do, will the remaining humans be any better placed for survival? I came across this book when completing my postgraduate studies in English/Canadian literature. I attended a seminar at university and by reading the cover of the book, I immediately could grasp what Yvonne Johnson must have been through. To be honest, I did not only take the seminar to simply read this book, but I've written a term paper about it and my lecturer rewarded me with the best grade of the course she said. Actually, this sounded like good news, but I did not tell her why I was conducting so much research about this matter. To tell the truth, I experienced in my childhood something similar. Although I was not molested by a family member, I went through nonetheless the emotions as Yvonne Johnson. Nonetheless, I did not give up and continued my life. I completed school and university. Reading Yvonne Johnson's book at university as a young woman helped me to find peace and to leave behind this repressing experience without losing sanity. Therefore, I thank Yvonne Johnson for her honest account and moving story, full of human immoralities as well as humanity. For me, she's is a woman who stood up against all of this and she taught me to go on with life despite of the hazards who tried to ruin my life.